Add your own unique touch to any outfit with a memory wire bracelet! 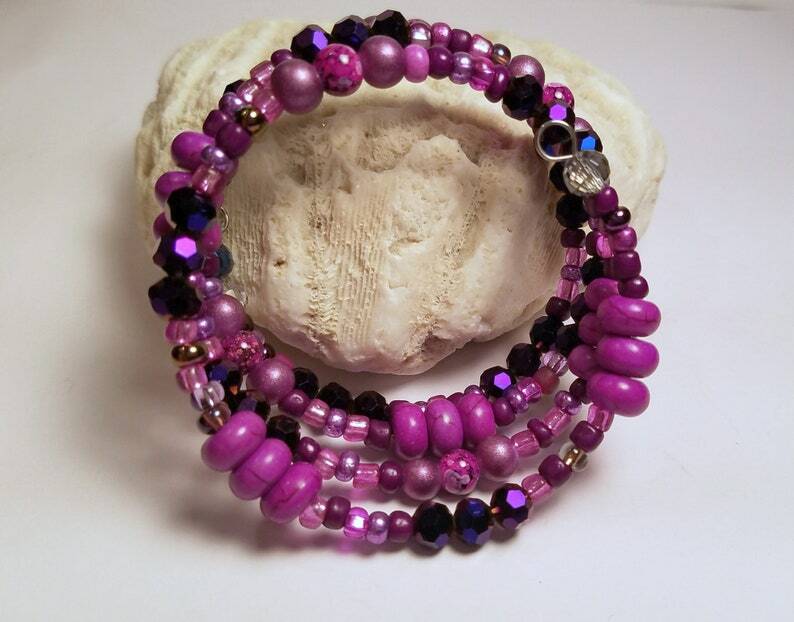 A one of a kind creation of purple and fuchsia beads goes with any style, jeans to dressy. Sparkly beads add a dash of magic as your wrist moves and catches the light. Lightweight stone and glass beads range in size from approx. 8 mm to 3 mm (approx. 1/4" to 1/8"). The bracelet is finished with a simple coil at each end. Memory wire is one long coil that looks like separate bangles. It adjusts to the size of the wrist (one size fits most) ...never loses its shape ...and is quick and easy to put on and take off - no clasp to struggle with. Start at one end, wrap it around and around your wrist, and ta da, all done! SHOP FOR MORE BRACELETS - get colors to go with all your favorite outfits!